First some administrivia. This site has been under massive attack by comment and trackback spammers. As a result, we’ve totally disabled the trackback feature, and limited comments to the most current three months of entries. We have also instituted a protected comment system to prevent automated spammers. But since the crowd that visits here doesn’t appear to be particularly chatty, that shouldn’t be a problem. We’ve also updated the software that runs the infrastructure of the blog. Whenever a set of changes of this magnitude is undertaken, it’s going to take a few days before the bugs are ironed out. Apologies if you tried to consult these pages and received error messages. We’re working on the remaining nits as fast as we can. Special thanks to The Resident Male – website plumber extraordinaire for the hours he’s put in wrestling with these issues. In the mean time, knitting here continues. Friend Dena was amazingly generous, giving me more of the gray/brown laceweight (also lots of other goodies destined for some more over the top lace projects). Ten thousand thanks! Armed with more yarn, I’ve been able to work more on the big shawl. I’m rounding the second corner and on the back stretch. No pix today though. It looks much as it did last week – a frothy gray/brown object too unblocked to see well. I now present it here as much to keep track of what the heck I’m up to for myself, as for others to play with. The pattern I’m using appears on Page 35. The original stumped me a bit because I couldn’t make the last three stitches work out correctly. According to the book, every row should end with a SSK, K2 – but I find that working the “uphill” side of my triangular dags, I have room for a plain K3, and on the “downhill” side as the dag narrows back, I have room for a K2tog, K3 – but need to cheat, working the first stitch on the wrong side return row as a P2tog to preserve the visual line of the narrow strip at the outer edge of my border. The pattern page (click on image above to get a readable version) presents both the original from the book, translated into modern notation; and my adaptation. More on corners. Using the same principles as the knit-from-center-out framing area on my cashmere shawl, I’ve done a mitered corner on my baby blanket. I do envision a problem now that I’ve finished a credible Corner #1, but I’ll deal with it when I get there. The first step was to make sure that I had a multiple of my halved row count available as live stitches along each edge of the project (small alerts should be going off in your head right now, but back to this later). That’s because using my chosen attachment method, two rows of edging are attached to each live stitch. Edging wrong side row: Work pattern to penultimate stitch, SSK last stitch together with a live stitch of the body. I can modify this scheme by doing an occasional SSSK on that wrong side row, in which one edging stitch is knit together with two live stitches from the body. This can be periodic and eat a specific number of stitches over a given number of repeats (eating one on every Edging Row 1, or every third row of the edging, for example); or it can be ad-hoc – performed when the thing looks like it’s getting too ruffly. Being a precise person, I prefer the former, but I’m not above sneaking one in using the latter should it be necessary. You’ve probably already figured out that working an edging onto a top or bottom of live knit stitches (or stitches rescued after unzipping a provisional cast on) will require a different rate of attachment than would knitting them onto stitches picked up off a side edge formed when the body was knit, via a standard slip stitch edge. The second step was to identify a clear diagonal on the existing pattern, and use that as an alignment point on which to build my mitered corner. In this case, the edge of the eyelet diamonds makes a good divider. So having stated the obvious, I violate it all. To create the live stitches all the way around my perimeter, I picked up, putting all the new stitches on a large circ. I started at the end of a knit-side row of stockinette, placed a marker and picked up a stitch in every slip stitch selvage on my left side edge. 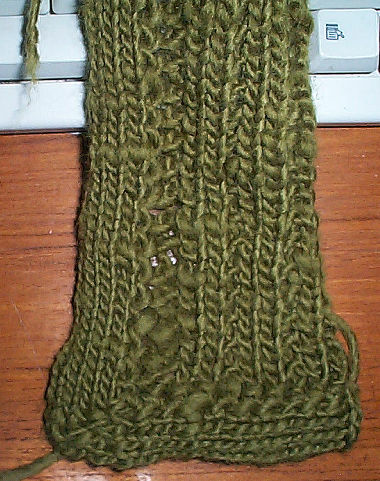 Then – not having done a provisional cast-on because I was on vacation and was lazy – I placed a marker and picked up the same number of stitches as I had stockinette stitches across the bottom of my half-hitch cast-on row. Then it was a march back to the origin point, placing a marker then picking up stitches along the remaining selvage. All is well and good (sort of). I’ve now marched around three of my four corners, and am in the home stretch, working my last straight side. Then it’s on to the final corner and graft. Now. Why all those alerts? Because my corner as graphed works best when I commence it on the tallest row of my point – not on Row #1, which is the shortest row. I didn’t figure that out until I was well along. Not wanting to rip it all back a THIRD time, I’m going to see if I can somehow cheat on Corner #4. 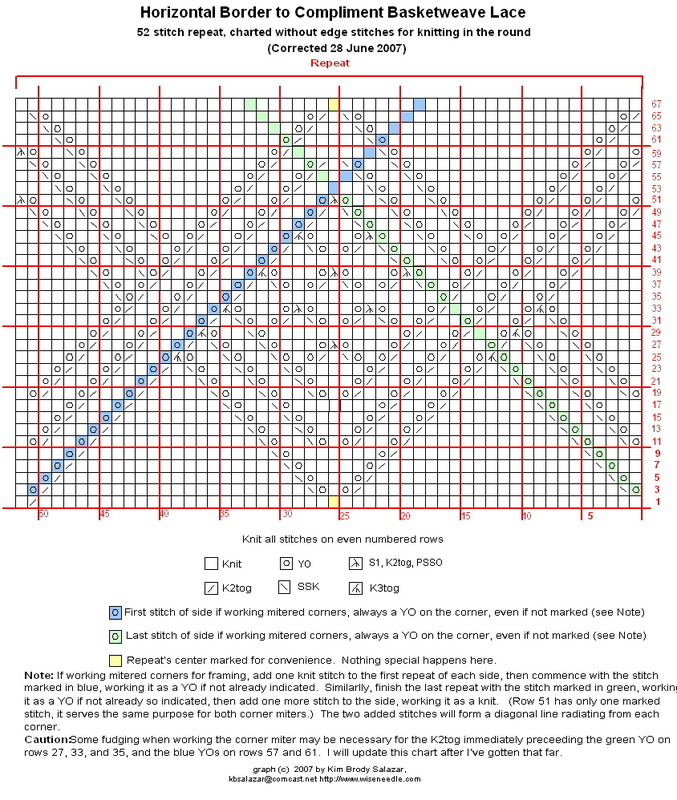 Here’s a graph for my modified edging and corner, with attachment instructions (done to the best of my ability). The shawl continues to grow. My center is very busy. I thought that the final piece would look nice if I used a complementing frame of a more solid appearance. 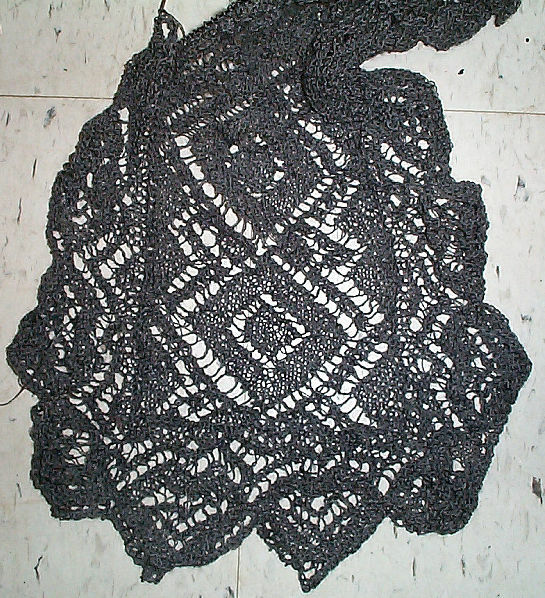 After paging through lots of lacy knitting books and pattern treasuries and finding nothing that sang to me for this purpose, I decided that I needed to make up my own design for the framing phase of my gray-brown shawl (curiously gray in natural light, and tobacco under artificial light). I’ve taken the center diamonds that fill the interstices in the basketweave and framed them with an interlace two “lace bars” deep (the basketweave sports lace bar elements that are four deep. I’ve got the thing charted out alternating solid centers with the diamond centers, but I am not sure if I’ll keep that or fill all of the centers with diamonds. Also, no I didn’t make a mistake. I deliberately cut off the pointy tips of the outermost lace bar unit. I charted it out both ways, but preferred the snipped tips. I think that one tiny detail adds to the horizontal focus of the piece. A real challenge in doing this was to come up with something that would work well both with my established stitch count (upped one to 52 per repeat to aid symmetry, with the required stitches to make the repeat count and corner picked up on one plain knit row just before commencing), and that would play nicely with a mitered corner. To do that, natural YO diagonals had to figure somewhere in the pattern, where they were (mostly) unaccompanied by a corresponding decrease. If they were coupled with a decrease, my stitch count for that round would not increase the required 8 per round needed to keep the piece flat. I’ve marked those lines in blue and green on the chart above. By placing my mitered corners at the indicated points I minimize the need for fudging counts – almost all of the green and blue squares bear a YO anyway (those that don’t I’ll work as one on the corner-most repeat). There are a few rows that might pose problems. – 27, 31, and 35, also 61 and 55. On each of these a blue or green YO needed to form the mitered corner is paired with an immediately adjacent decrease on the “will be worked” side of the diagonal establishing the miter. I’m not quite sure what to do about them, and will experiment when I get that far. Right now I suspect that I’ll need to do a double YO at that those spots in order to maintain stitch count. 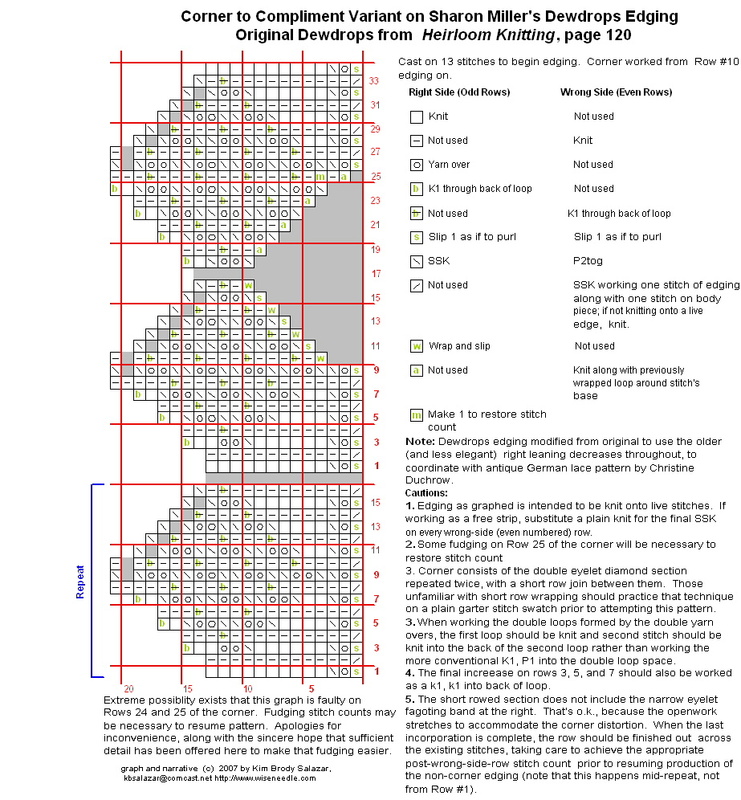 So I will continue knitting along, working my framing chart until its completion. After that I might work another row of double YO beading to finish off the section. And then comes choosing (or devising) a suitable edging. 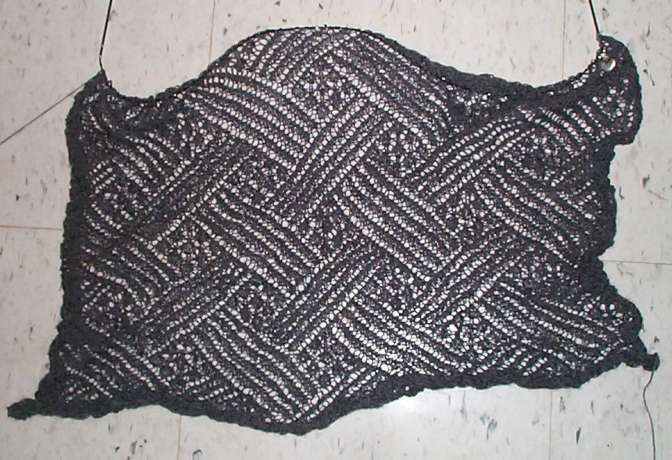 If anyone out there has done this – designing an original lacy knitting mitered corner on the fly – and is now experiencing a forehead-thumping moment because I’ve missed something obvious, please let me know. Your input would be most appreciated! Incremental progress on two fronts here at String. First, demolition is now complete. Evil Upstairs Bathroom having been stripped to the studs now finds itself at the very beginnings of build-out. 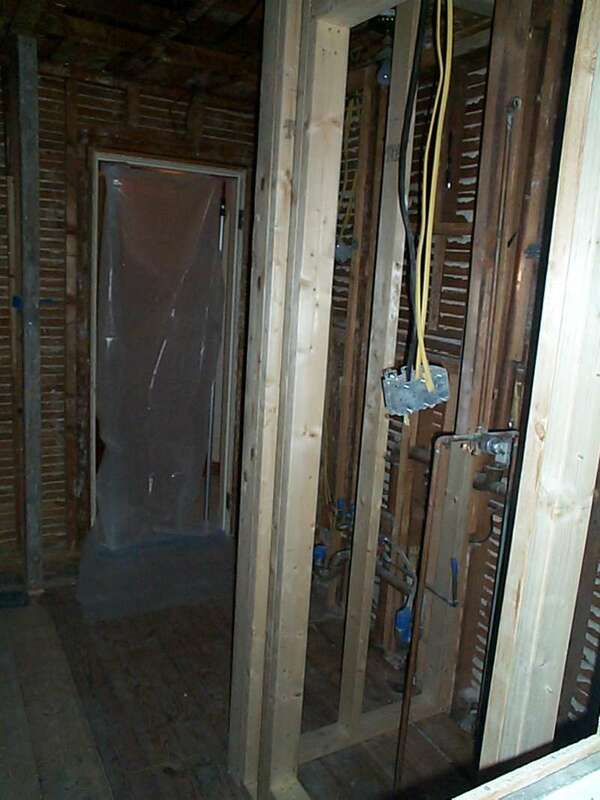 The new larger shower stall has been roughed in, and the electrical work has commenced. You can see the back side of the lath and plaster hallway walls on the outside of the old wall studs. 1912 was deep in the pre-drywall and wallboard era. 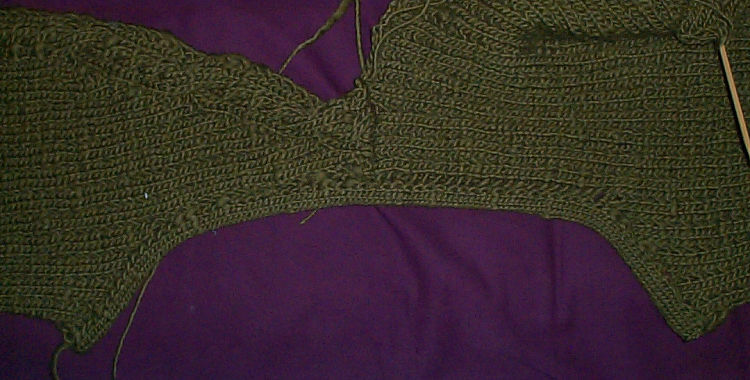 And on the lace shawl, I’m over the half-way mark in constructing the center square. I’ve got only one or two repeats left before my proportions are correct. 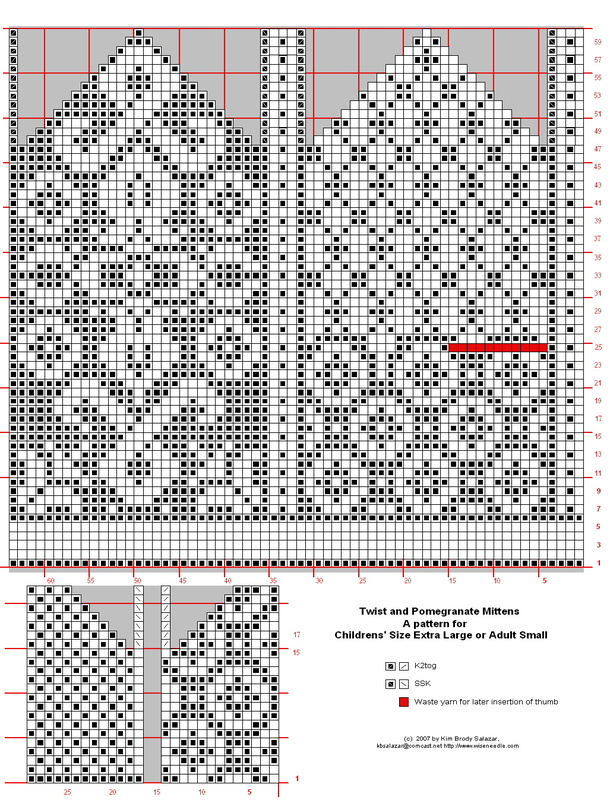 The original lacy knitting pattern from The Knitted Lace Patterns of Christine Duchrow, Vol. 1 was presented as part of two complex garment designs – a blouse and a baby bonnet. There are a couple of complementary simple band patterns for cuffs and trim on those projects. Except for the introduction (which provides a helpful translation key for the symbols and some historical German knitting terms), the entire book is in the original German. From what little knitting German I’ve picked up I can tell that even the written parts aren’t quite modern German knitting prose. Like English knitting instruction writing, the conventions in German have changed over time. 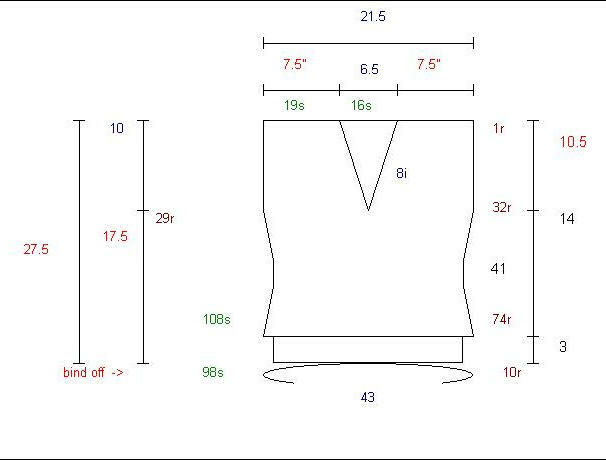 While I can work from the chart to make my own whatever, it would be an extreme challenge to knit up the blouse as described. As the editors of this book report, Duchrow was among the first to try to present knitting instructions in graphical rather than prose format. Her graphs are idiosyncratic by modern standards and use letters and symbols rather than visual representations to represent the various stitches, but with a bit of practice her graphs are not difficult to knit from. Even though I can’t read a word of the accompanying text in Vol. I, I’ve ordered a couple more books in the same Duchrow reprint series. 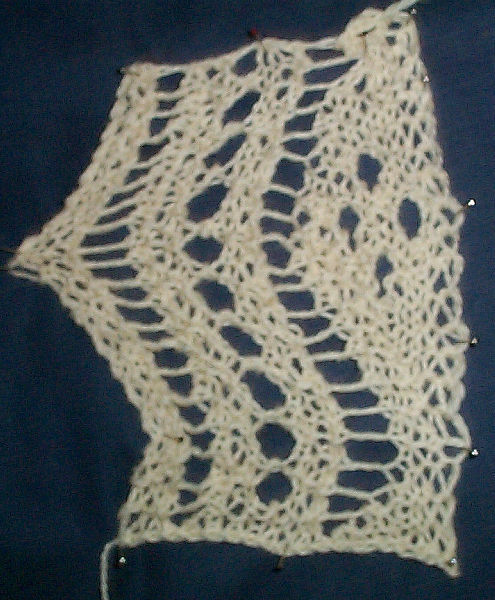 If you’re a lace and lacy knitting fiend, you’ll probably have as much fun with Duchrow patterns as I am. I feel confident I can share the design because I have redacted it into modern symbols, included corrections, and made changes in the pattern as presented. While my graph is recognizable as a variant of the historical one, there are subtle differences. For example, the original graph for this pattern treats all double decreases identically, rather than using directional variants to reinforce the framing diagonals. It also didn’t continue the pattern into the edge areas as uniformly. It also didn’t show the even numbered row. 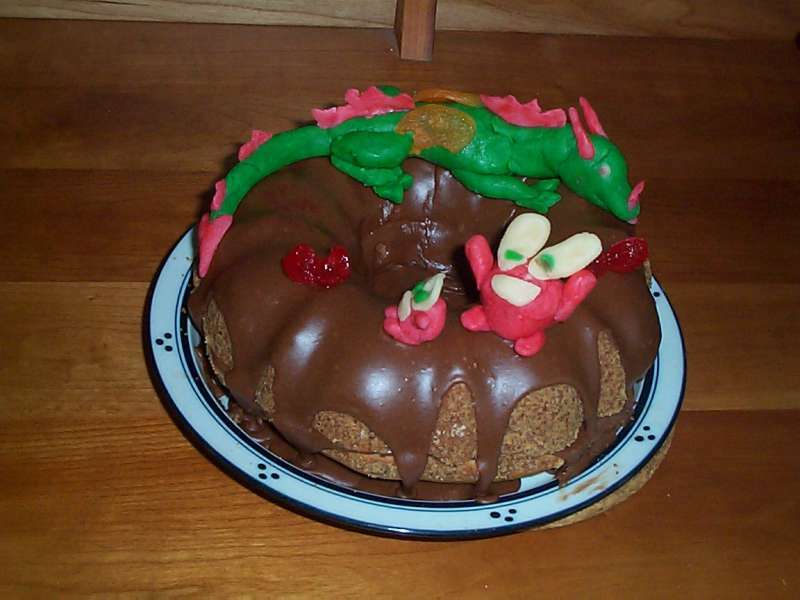 But for all of that, the pattern works up quite nicely even in the original presentation. 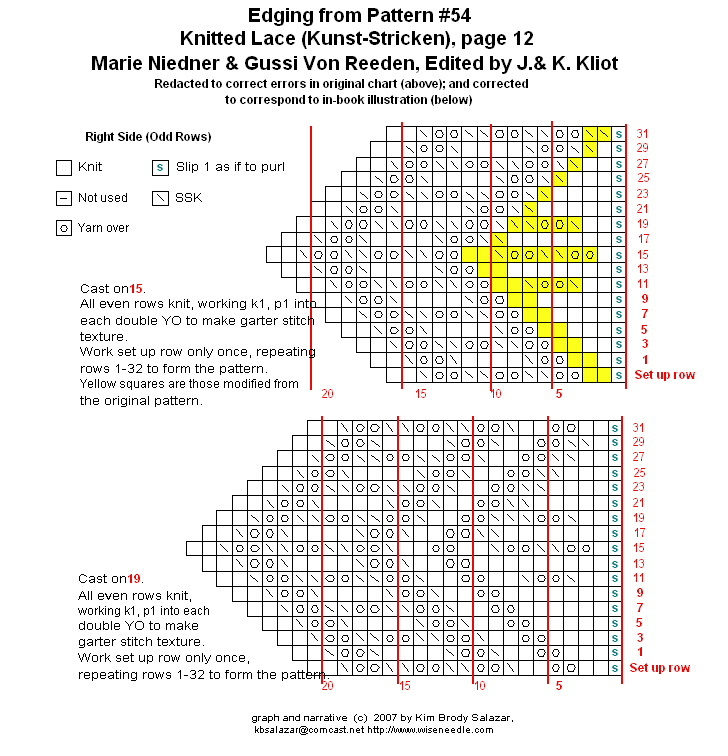 I share my redaction/correction as tribute to the original author and the editors of this work, to help other knitters bridge from modern instructions to historical ones, and to encourage others to seek out these patterns and knit them without fear. Interesting conjecture – from the style of the blouse, it would not be a stretch to say that it was current around the time my house was built. 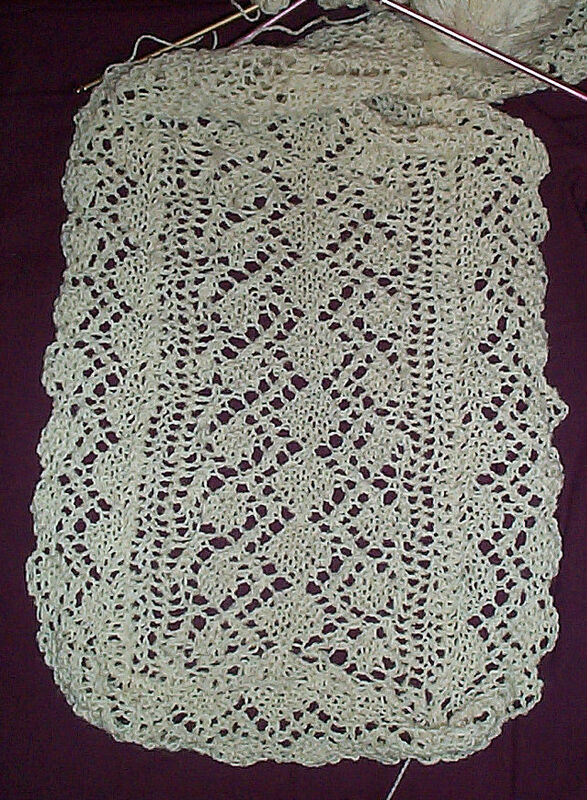 For all I know, the original owner may have sat in the library 95 years ago, knitting the same lace patterns I am working from today. 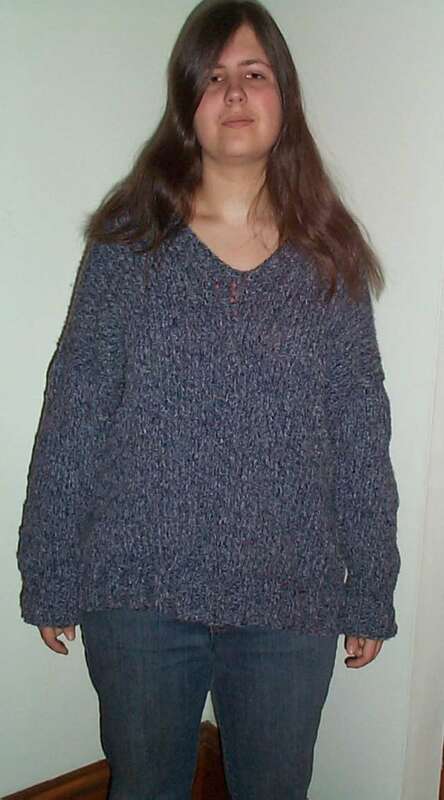 UPDATE: THIS PATTERN IS NOW AVAILABLE AS AN EASY TO PRINT PDF, AT THE KNITTING PATTERNS LINK, ABOVE. My mis-matched mittens are done. Today I present pix plus a write-up and more reliable graphs. I changed the placement of the decreases on the graph. 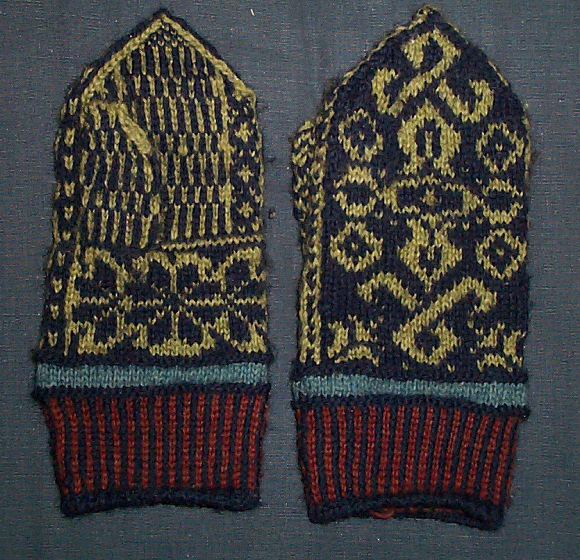 They’re now shown along the side strips rather than on the triangle that forms the mitten top. This eliminates any confusion caused by the double // notation inherited from the original inspiring mitten blank. I’ve also fixed the pattern alignment on them so that they integrate better with their palms and graphed my thumbs out to be a stitch wider than the hole provided for it in the mitten body. I found that I needed to pick up a stitch at the left and right corners of the slit formed when the provisional stitches were removed. If I didn’t do that, I ended up with a hole at either side of the base of my thumb. 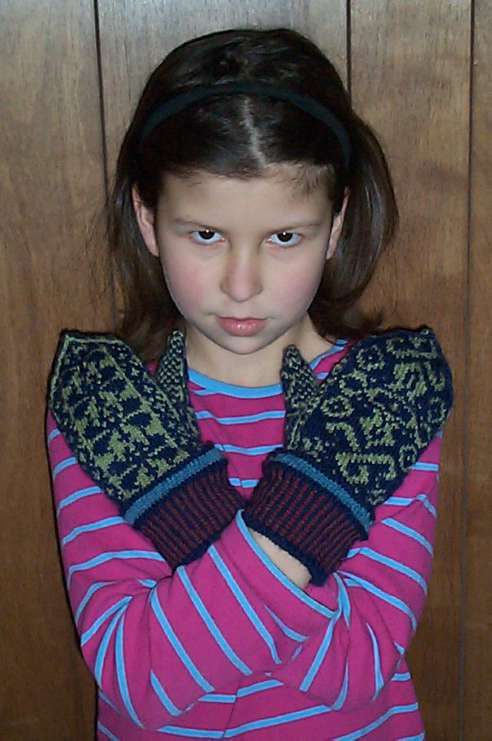 First, proof that the mittens are done, courtesy of overly dramatic Smaller Daughter (code name Sarah Heartburn). She does have very large hands and feet for an 8-year old, a sign that she’ll probably inherit my family’s height (at 5’8″ I’m the shortest female in my immediate family). But the mittens are a bit large on her. I’d call them kids’ extra-large, or teen/small woman size. Color D: About 5% of the total – Light blue. 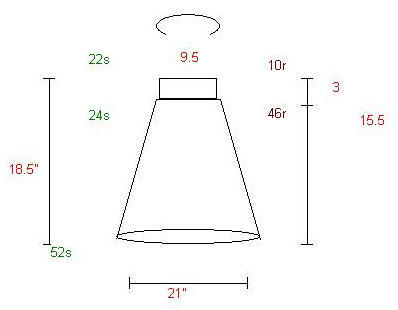 Size 3.25mm double pointed needles (Two circs or one-circ “magic loop” methods can be substituted). DPNs highly recommended for the thumb. Using the predominant color and a tubular cast-on, cast on 64 stitches. Work in two-color K1 P1 corrugated ribbing for 2 inches, using Color A for the purl columns and Color C for the knit stitches. Using Color A, knit one row and then purl one row. Using Color D, knit four rows. 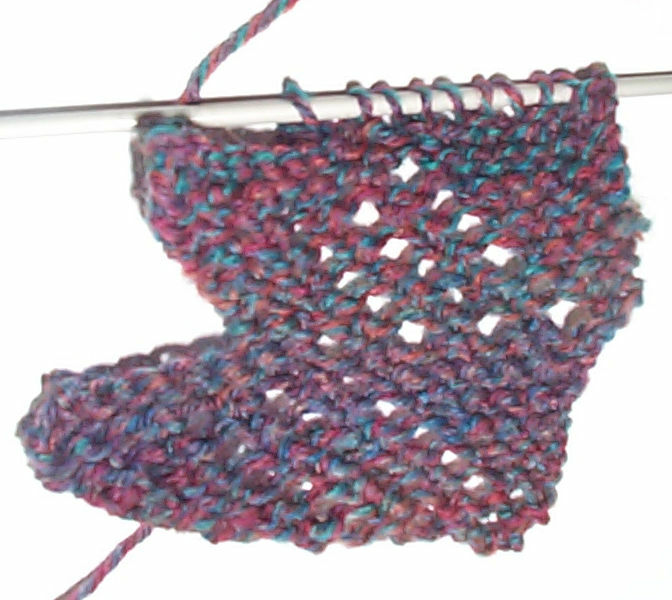 Using Color A, knit one row and then purl one row. 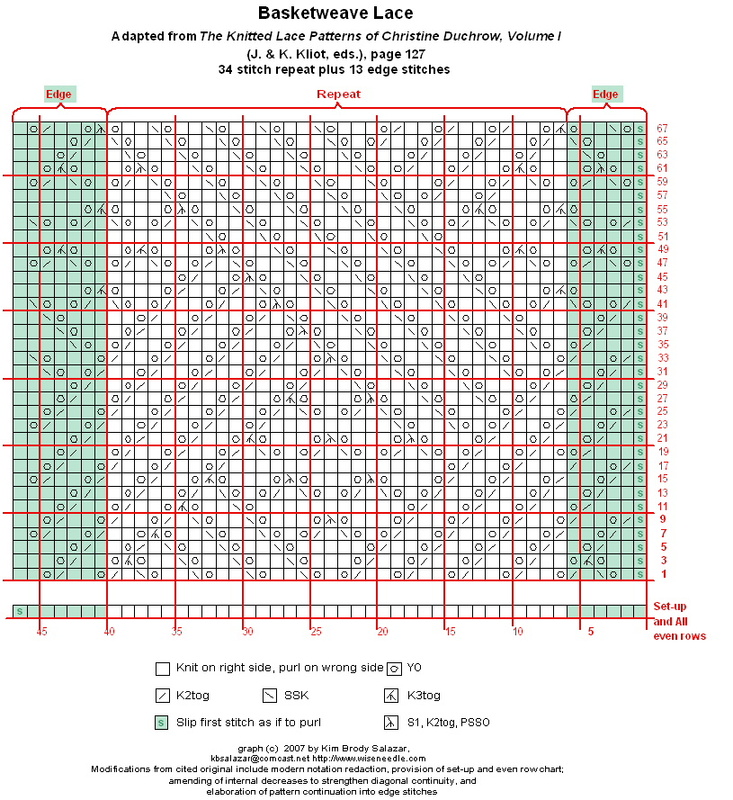 Using the chart of your choice (below) for stranded knitting, work as shown. The creative will note that given four different and interchangeable mitten sides, any combo thereof would make perfectly suitable mittens – all four as presented needn’t be used. Regardless of the mitten graph chosen, introduce a small bit of waste yarn or string for the stitches indicated in red. Make sure that you mirror that placement for your left and right mittens, as shown in my charts. Alert: On the pomegranate and knot mitten chart, I call for decreases done in Color A. I’ve introduced a separate symbol for those decreases. It’s noted on the chart. End off the mitten at the top by grafting together the last 8 stitches. Returning to the waste yarn introduced for the thumb, carefully remove it, slipping the live stitches above and below the newly formed slit onto DPNs. Using a third DPN start at the side of the thumb to the right of the newly created hole. Looking at the thumb chart for the visible side of the thumb (the one with the pattern that matches the palm), pick up one stitch in the right side of the newly created thumb slit. 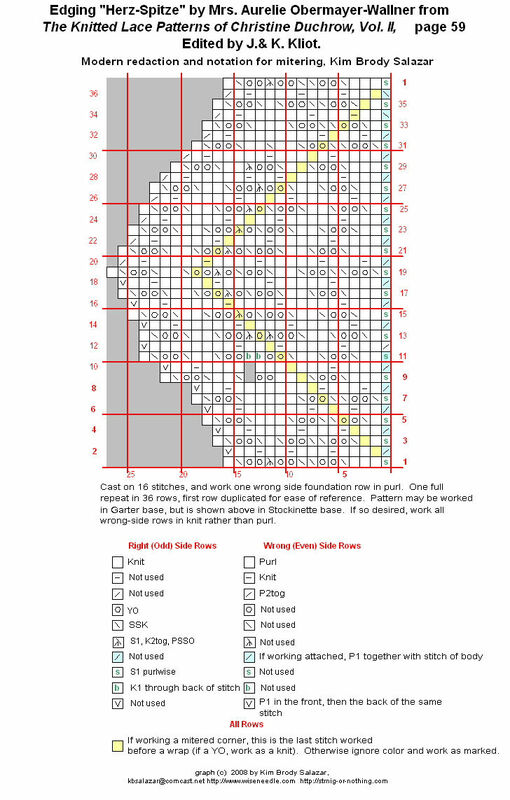 Do this in the color indicated for the first stitch of the thumb chart. 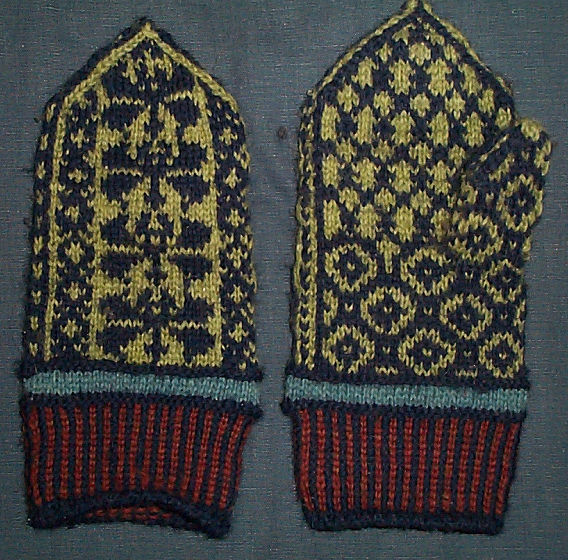 Note that the thumb pattern should seamlessly integrate with the palm pattern, although each of these mittens does that in a different way. 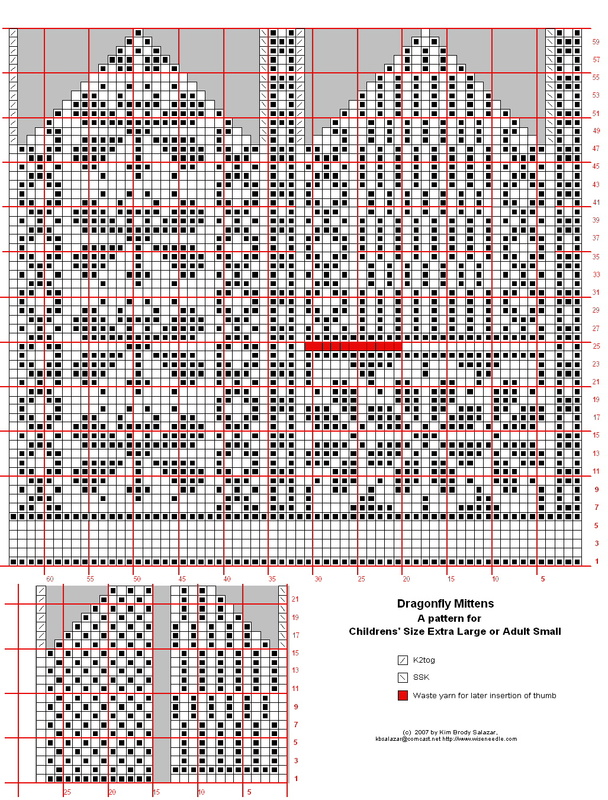 Work across row 1 of the visible side thumb chart. Switch to the inside-the-thumb chart (the one with single stitch checks), again starting with the first charted stitch, pick up one stitch in the side of the thumb slit prior to working across the rest of the thumb chart. 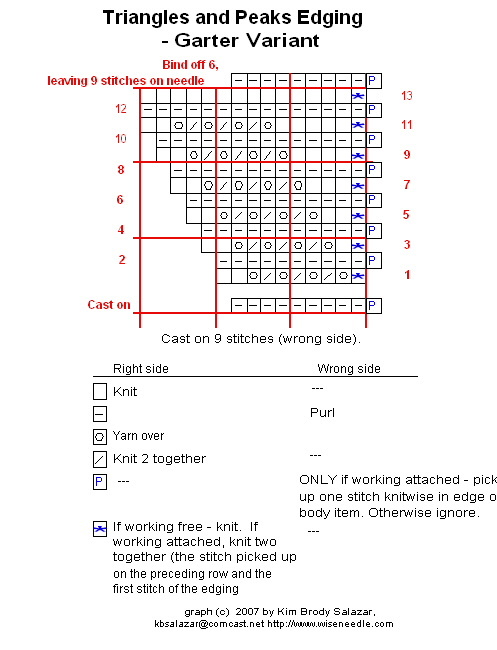 Follow chart as shown, grafting the final stitches at the tip of the thumb. Darn in all ends.